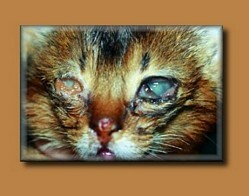 Feline herpesvirus (FHV-1) is a common cause of eye and upper respiratory infection in the cat. This virus is very common in the cat population as 95% of cats have been exposed, but it is not contagious to people or other species of animals, such as dogs. Herpesvirus is easily passed from one cat to another, through sneezing, coughing, grooming, and/or simply being in close contact with an infected cat. Clinical signs associated with infection can vary greatly between cats. Some cats affected with FHV-1 may only have mild conjunctivitis(inflammation of the white part of the eye) of one or both eyes. While other cats with a more severe form of the disease may show ocular (eye) and nasal (nose) discharge, conjunctivitis), coughing and sneezing. Some cats may develop ulcers of the cornea (the clear “window” in the front part of the eye). Corneal ulcers can be very painful and serious enough to cause noticeable scarring on the normally clear cornea. An infected corneal ulcer may even progress to cause perforation of the eye. After recovery from the herpesvirus infection, an estimated 80% of the cats become a carrier of the disease. In other words, the disease goes into temporary remission and the virus becomes latent in the nerves of the face. In cats, stress and illness may reactivate the virus, causing repeated infections or recurrences of the clinical signs throughout their life. Repeated or chronic infections have been associated with diseases such as â€œdry eye,â€� symblepharon (adhesion of the conjunctiva to itself or to the cornea), corneal sequestrum (an abnormal brown plaque formation on the cornea), and possibly eosinophilic keratitis (an immune-mediated condition of the cornea). The definitive diagnosis of FHV-1 is accomplished by laboratory testing. Many tests are available through a professional diagnostic laboratory. They include virus isolation; fluorescent antibody (FA) testing; serology, such as ELISA or serum neutralizing titers; and polymerase chain reaction (PCR) testing. It is important to realize that these tests may have false negative results. On the other hand, certain cats in the carrier state, but without apparent clinical signs, can also test positive for some of these diagnostic-modalities. Treatment for FHV-1 is aimed at controlling clinical signs and reducing secondary complications. It is important to note that there is no cure for FHV-1, and once infected your cat has the virus for life. Some animals will never have clinical disease after the initial infection, while others may have frequent recurrences. Cats that have recurrent outbreaks often have a stressful trigger that can be identified (i.e. new pets in the household, houseguests, etcâ€¦). Avoiding the stressor can reduce the number of outbreaks. Typically, therapy includes frequent antiviral drops or ointment applied to the affected eye(s). Occasionally, oral antiviral medications are used in cases that do not respond to topical drugs alone. L-lysine is an amino acid dietary supplement that has been shown to inhibit viral replication in a laboratory setting. There are no studies proving that giving L-lysine as a supplement benefits cats with FHV-1, however, many owners feel it reduces outbreak frequency and severity. There are no known side effects at the typical dose of 500mg of L-lysine twice daily for adult cats. Vaccination against herpesvirus infection is included in the typical feline vaccination schedule provided by your primary care veterinarian. The vaccine minimizes the clinical signs of FHV-1, but does not prevent future outbreaks. Additionally, the vaccination does not cure cats already infected with the herpesvirus. If you have any question about this information please contact your veterinarian.